How does it operate in reverse - the blades seem to adopt an extreme pitch angle that will only generate forward thrust in reverse? Is the pitch user adjustable - Can it be done underwater? Do I have to set the pitch when I get the unit delivered? Can I adjust the reverse pitch? What are the equivalent inches of pitch to degrees? What is involved in mounting the unit ? Do I need to take the unit apart before mounting it on the shaft? How strong are the composite blades? Should I buy spare blades to carry on board? Why do you use Acetal nuts to attach the unit? How is the unit lubricated - how often should it be greased? Does the unit run smoothly? How much tip clearance is required? Will a Kiwiprop improve my motoring performance? To what extent will a Kiwiprop improve my sailing performance? Your diameter recommendations are larger than I was expecting? What is the high time unit? 1: How does it operate in reverse - the blades seem to adopt an extreme pitch angle that will only generate forward thrust in reverse? While not obvious from an external examination, inside the unit are two dogs and stainless steel torsion spring that allows for 100 deg of rotation between the casting carrying the blades and the boss - which is mounted on the shaft and contains three reversing rollers. When reverse is engaged the water pressure generated against the blades causes the blade assembly to rotate around the boss against the spring and in so doing, the small reversing rollers will engage against the root section of each blade and force the blades back into the AHEAD position. The dogs will then prevent further rotation of the blade assembly which will then rotate with the boss causing the unit to operate just like a fixed three bladed prop in reverse - only at maximum pitch. The pitch is not adjustable in reverse but automatically goes to the maximum available which will be ~ 23.5 deg. Thus the trailing edge of each blade becomes the leading edge during reversing like a fixed bladed propeller. 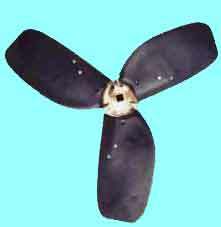 This is different from all other geared feathering propellers which rotate the blade through 180 deg during reversing. The spring returns the unit to it's normal ahead position which allows the blades to feather once neutral is selected. 2: Is the pitch user adjustable - Can it be done underwater? The pitch can be very easily and quickly adjusted by the user with just an Allen Key. In the root of each blade facing aft for easy access is a stainless steel set screw. Turning this in 1/3 rd of a turn will increase the pitch by 1 deg. This can be easily done underwater with dive gear. The pitch screws are self locking into the blades and remain locked by cutting the last few turns into the blade as in a Nylock nut. The root of the blade coincides with the joint line on the boss to give a reference of 20 deg if a protractor is not available for example when faced with changing a blade. [ Blades shipped after April 1 st 2004 - Unit # > 446 from the new dies will equate to 18 deg of pitch in this position ] Mounting the Allen Key in a short length of dowel will ensure it floats if operating underwater. 3: Do I have to set the pitch when I get the unit delivered? No. Unless requested otherwise - the unit will be delivered with the pitch targeted to allow the engine to achieve it's rated max rpm under full load which is required for warranty purposes on all new engines. This will be based on the information collected from our extensive database of engines in use. Higher pitch settings will increase cruise speed for a given rpm at the expense of achieving maximum engine rpm and higher power output. Every installation is however different. Shaft angle, exhaust back pressure from design or corrosion, fresh or salt water, altitude, cleanliness of the prop, engine age and compression, auxiliary take-offs such as compressors & alternators will all impact on engine rpm achievable. On the typical smaller engines installed as auxiliaries - these can have a disproportionate effect on the maximum rpm achievable. Typically 80% of users never adjust the pitch from the original setting. 4: Can I adjust the reverse pitch? 5: What are the equivalent inches of pitch to degrees? All feathering propellers have flat blades to ensure minimum drag when sailing with no rotational forces. Normal propellers have progressive pitch with the pitch angle increasing towards the blade root to accommodate the slower circumferential speeds from the smaller diameters. Thus to find an equivalent pitch in inches it is necessary to integrate over the diameter. Empirical experience would indicate that on a 17" propeller a pitch setting of 21 deg equates to a traditional pitch setting of ~ 12 inches. Obviously for a larger diameter the same pitch setting will produce a higher equivalent pitch. Thus it is much simpler to operate in a degrees of pitch regime for feathering propellers. 6: What is involved in mounting the unit ? Do I need to take the unit apart before mounting it on the shaft? Unlike other folding or feathering propellers the unit is ready to be mounted and need not be disassembled. After the appropriate checks which are covered in the user manual, the unit can be mounted on the taper, or spline if a Saildrive, and the nut tightened up using a standard �" square socket drive. The nut is then locked in with 2 stainless set screws in the rear of the boss using Loctite to lock the locking screws and the unit is ready for operation. 7: How strong are the composite blades? Clearly the blades are not as strong or as stiff as bronze, but the issue is - are they strong enough for the purpose for which they have been designed. Virtually all modern aircraft have composite propellers. Zytel contains ~ 35 % glass by weight and is thus both very strong and stiff. The black colouring is not carbon based and thus does not have a corrosion potential. DuPont have extensive technical information on their web page regarding the physical characteristics of the many different grades of Zytel they have available. By choosing a 3 bladed design over a 2 bladed unit the forces involved are immediately reduced to 33 % per blade vs 50 % - a 33 % reduction. Another design issue is that composites and the economics they enjoy allow a blade to be sacrificed in a catastrophic situation. With a substantial impact on the blade tips ( always the first part to hit ) they invariably tear from the mounting hole outwards leaving the castings undamaged. We believe it is better to loose an easily replaceable blade costing $ 100 than a whole propeller or drive train when hitting the ground or a floating log or mooring chain. This can be very expensive in a Saildrive installation where the whole leg is at risk. Ropes caught around the unit will simply stall the engine and in each of a number of cases where this has happened to date the unit has emerged undamaged. The blade form with well rounded leading edges at the root is designed for these events. We have not yet had a blade fail in service and are confident that they are stressed correctly for the application they serve. Remember composite propellers are now freely available for outboards up to 250 hp. So in simple terms the answer is - quite strong enough ! 8: Should I buy spare blades to carry on board? Our advice is that if you have a catamaran with no keels that is going to hit the props first if ever grounded - carry a spare set of blades. If you are heading off on a world cruise with the potential to be in some out of the way places or cruise in high risk areas where there are known problems such as dead trees or coral heads - then take a spare blade or set. In many ways the cheapest and best insurance is to carry a cheap fixed 3 blade unit to get-you-home. For general use we see no more or less need to carry spare blades on board than you would with any other prop. We have very little demand for spare blades other than in the above situations. 9: Why do you use Acetal nuts to attach the unit? Very large numbers of propellers and folding propeller blades have been lost over time because the nut or locking screw has failed. The most frequent reason for this is corrosion. Most propeller nuts are machined from Rod Stock and certainly not AB2 or Nickel Aluminium Bronze - the Bronze of choice for marine applications. Like 316 Stainless Steel it is strong on corrosion properties but is very difficult to machine and is not generally available in Rod Stock. Nuts are highly stressed when tightened and this in itself is a major cause of failure from the well documented issue of stress corrosion. Acetal is not suitable for the finer threads that are used on metric shafts - M20 or M16 x 1.5 pitch or UNF threads. Nor is it suitable for Saildrives where the threaded stub shaft extending is very short. In these situations we use 316 Marine Grade Stainless Steel. On BSW or UNC threads [British Standard Whitworth or Unified Coarse] both of which are very coarse threads, Acetal can be safely used in the knowledge it has been tested to over 5 times the largest load it will ever undergo during a reverse function and is not subject to any form of corrosion. The base of the locking screws cut into the Acetal nut and prevent it ever coming undone. We have never lost a Kiwiprop from the an Acetal nut failure in over 1000 boat seasons of use with high time units of over 5 years usage. We will continue to always prefer engineering plastics where appropriate over all metals in a marine environment. 10: How is the unit lubricated - how often should it be greased? This topic is covered in the user manual but in summary the unit as delivered contains lubricants sufficient until your next maintenance haul out. Each blade must then be greased via a lubrication point accessed by removing the small Pozidrive stainless screw on each blade face. In addition there are two small grease holes, one very close to the DelrinT nose cone in the bronze casting that takes the thrust of the pitch screws and one near the outer perimeter of the bronze sphere at the rear of the unit. These have been chamfered to accept a standard needle nosed grease point. You will need to remove the outer guard off the needle. Each of these five grease points should then be filled with a high quality marine grease eg ShellT Nautilus Marine Grease - NLGI No 2. Check the reversing rollers are free to turn and free up with a light lubricant - such as CRC, and pliers if necessary. These can become stiff from marine deposits if the unit has not been used for some time. 11: Does the unit run smoothly? Yes - this is a factor often commented upon in the feedback we have received from new Kiwiprop users. For any rotating mass the secret to minimizing vibration is to first lower the total mass of the rotating assembly and then ensure that the mass is concentrated as close as possible to the axis of rotation. The Kiwiprop is much lighter than comparable bronze units at < 3.5 kg but more importantly because of the composite blades being much lighter than the typical bronze blades of say a 2 bladed folder, the mass is much more focused towards the center of the unit. Combining these two factors produces a very smooth running unit that offers minimal vibration and much lower wear rates on stern bearings. Blade clearance to the hull is less critical than with folding propellers as the blade tips are a finer section than folding props. They do not need the thicker sections needed to contain the mass required to improve the reversing thrust from the additional centrifugal force. 12: How much tip clearance is required? To obtain clean water away from the water that is dragged forward along with the hull and impacts on propeller performance all propellers require clearance from the tips to the hull. Having low tip clearances can also cause vibration to be transmitted through the hull from the disturbance caused by the propeller blades displacing the incompressible water as they sweep past the hull. Some rules of thumb use 10 % of the diameter - but higher clearances generally lead to higher shaft angles which reduces propeller performance. Due to the low boat speeds typically involved with low powered displacement yachts - clearance is not as critical as on many applications. With thin tips, unlike folding propellers which use the mass in the tips to provide reverse thrust from the centrifugal force generated, our empirical experience is that clearance can be lower with virtually no impact on performance or vibration. We would suggest no less than �" or 12 mm in a tight situation - obviously more is better. 13: Will a Kiwiprop improve my motoring performance? In a nutshell - if your installation has shaft speeds that exceed 1500 rpm at maximum rpm [ Divide max rpm by reduction ratio in ahead ] or you have an installation with high shaft angles or you have a propeller with very low blade area or your propeller does not have access to clean water flow then you are never going to achieve optimal efficiency from any propeller including a Kiwiprop. The quantum of any improvement available will then depend upon the extent to which your exiting propeller is optimal. We would expect a Kiwiprop unit to match very closely the motoring performance of a well sized fixed three bladed unit with maybe a ~ 0.1 to 0.2 knot reduction for the same cruise rpm. Our experience is however that in many situations the existing propeller is not well matched and in these installations we can often deliver increased motoring performance. Typically this will come from replacing a fixed two bladed unit with insufficient area or a three bladed unit that has not been sized correctly in the first instance. Variable pitch allows the unit to be set economically to what is optimal - as distinct from what's in stock. Refer to our Testimonials on the web pages for specific examples relevant to most popular engines and drive train options. 14: To what extent will a Kiwiprop improve my sailing performance? This is always very difficult to comment on due to the very large number of variables involved. What is known from the published work from MIT in their lab is that a fixed three blade 16" propeller will produce drag of over 70 lbs at 8 knots. This was reported in Practical Sailor " October 1993 and January 1995 issues. [ Refer to our web pages ] This will have a very significant on sailing performance. Our empirical experience is that a typical 30 to 40 foot vessel hard on the wind in about 15 knots of breeze will achieve maybe an extra 0.75 knots of boat speed and point about 10 degrees higher into the wind with very significant increase in VMG over a fixed three bladed propeller. Reaching can deliver up to an extra 1.5 knots - again very dependent upon the individual vessel and situation. In short - the sailing performance improvement will be dramatic and it is for this reason one would switch from a fixed blade propeller. Versus an existing folding propeller there will be no improvement in sailing performance - but a dramatic improvement in reversing function. 15: Your diameter recommendations are larger than I was expecting? The design of the Kiwiprop unit has highly raked tips for two reasons. First the foil section of the blade must operate in a streamline when generating the feathering function even when mounted on a shaft which will typically be inclined both to the waterline and even more so to the water flow following the buttock lines which are invariably rising around the stern area near the propeller. The raked tips thus address the requirements of maintaining the feathering stability of individual blades in real world installations with shaft angle and buttock lines distorting the streamlines over the unit. In addition as the power requirements of a propeller approximate a function of diameter ^ 5 th - obviously all the work is done at the tips. This has long been know by aeronautical engineers - just look at the tip design of the latest helicopter blades or observe the latest propeller tip design on the new turboprop commuters both of which give a very good indiction of current thinking. So it is critical for good motoring performance to pay considerable attention to the foil section at the tips. When in a motoring as distinct from feathered position the design of the blade tips follows what is generally seen as best current practice. Foil design is comparable in both water and air under defined criteria. The effect of these design constraints is that to obtain the necessary area the tip diameters are larger than comparable units. Measuring at the center of the blade which gives an " average " diameter over the shorter leading edge and longer trailing edge will produce diameters roughly comparable with competitive units. Thus we work in what we term " nominal diameters " which are lower than the maximum OD's required for space requirement issues by ~ �" and generally ~ �" larger than competitive recommendations. An appropriate caution is clearly noted in the Customer Order document. If there was a simpler system we would use it - but once you go to highly raked tips - these measurement issues unfortunately appear. 16: What is the high time unit? Unit # 17 was fitted to "REWARD" - a Lidgard 44 cruised extensively with a Bukh 48 Saildrive in November 1997.